The Who, The Beatles, and The Rolling Stones are the bands I first loved when I was getting into music around age 7 or 8. Anything I subsequently liked in Casey Kasem's American Top 40 or elsewhere had to stem somehow (however loosely, Nena "99 Luftballoons," I'm looking at you) from those three roots. 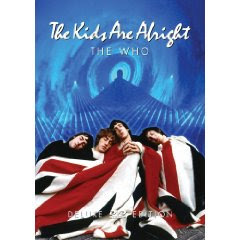 So it's amazing that I'm just now getting around to watching The Who's 1979 rockumentary The Kids Are Alright. There's not much that needs to be said about it. They play a lot and joke a lot. Keith Moon is a crazed freak show who plays and beats up his drums like no other rock drummer will ever do again so well. John Entwistle's fingers jaw-droppingly motor on top of the bass. Pete Townshend's hair catches on fire from one too many guitar-destructo moments. And Roger Daltry swings his microphone and is generally a more jock-like version of Robert Plant. Just watch the film. Few bands have ever had four such powerhouse individuals.